It’s cold. Inside and out. 19 degrees here outside this morning. 55 degrees inside. 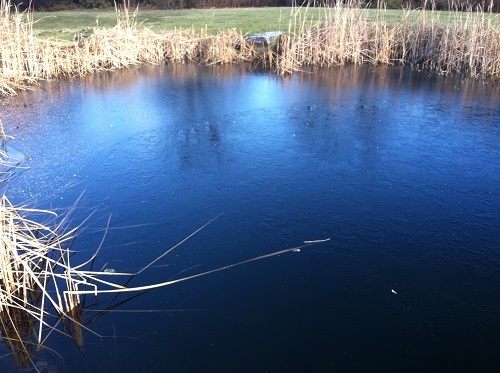 It’s so cold that the pond is freezing. If the snow wasn’t a big enough clue that winter is coming, this cold and ice certainly are. 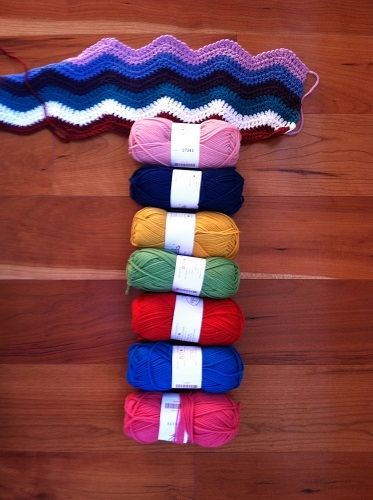 I’m a little out of my comfort zone with some of these colors but that’s part of the reason I’m making this blanket. 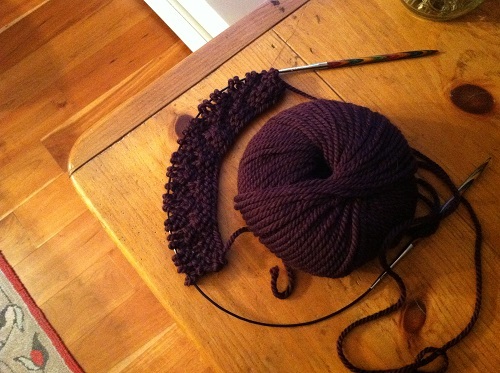 Doing something I’m not as familiar with – crochet – and use all the colors, including ones I wouldn’t normally use because they may actually look good. The white, of all colors, is bothering me a little. It seems too stark. And I’m not thrilled about yellow in general. Or orange. (OK, just realized I forgot to order an orange). And sometimes green. So, only time will tell what happens with this! Hopefully it will go well, because right now it’s too small to keep me warm while I wait for the wood stove to heat up the house. I’ll have to break out the Umaro blanket. when. When. WHEN am I going to knit all these, as well as the other 100+ projects in my Ravelry queue???? Bad light, I know. Stay tuned. Meanwhile, I’m off to find that Umaro and work on my Ripple. Posted in Uncategorized and tagged brooklyn tweed, knitting backwards, ripple blanket, umaro on November 13, 2013 by lizytish.